Please note change of ride for Sunday 1st April. Instead of Swaffham we will ride to Fakenham where the second Fakenham Criterion races will take place. Happy Easter! Hopefully by the time you read this spring has sprung and the ice of winter will be only a memory as people get out on their bikes. Plenty of people were cycling around Holkham, Wells and Houghton on our first long ride of 2018, so we hope this trend continues. If you would like to join our rides part-way at somewhere like Sandringham, Watlington or Terrington, just ask and we will estimate a meeting time. In May, we have several traditional rides, including joining our Camcycle friends for their Reach Ride on the Bank Holiday Monday, riding 12 miles from Cambridge Market Square to the historic Reach Fair with many hundreds of others, then a few hours later continuing on to a ride or train home, depending on conditions and feeling. To the east, we've continued working with Norwich Cycling Campaign to lobby Norfolk County Council and Norfolk Constabulary which we think has helped improve the council's Cycling and Walking Action Plan, and the police's acceptance of camera footage and Operation Close Pass. 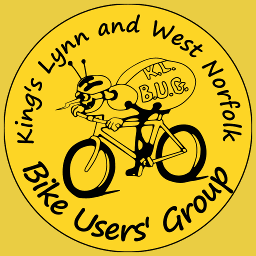 The council has an Access Improvement Plan out for consultation now (see www.KLWNBUG.co.uk for links and our response when ready), so we'll keep working with Norwich campaigners and maybe get out for a joint ride some time!